In recent years, the research and development team at Netafim has been able to develop drippers that deliver one litre per hour and less. This was made possible through the use of TurboNet™ flow path technology, which allows for very low delivery rates while maintaining clog resistant flow path dimensions. These drippers permit certain irrigation applications that were not possible before. In the early 1980s, the introduction of integral pressure compensated drippers did a lot to improve the hydraulic accuracy of drip irrigation systems, especially on difficult topography. 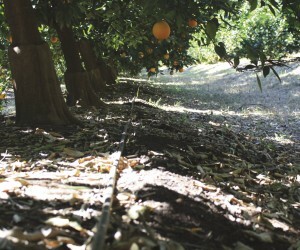 However, when using traditional 3.5, 2.3 and 1.6 liter per hour drippers in orchards, especially on sandy and rocky soils, irrigation involves a few short irrigation pulses of less than one hour’s duration per day. Despite using high accuracy pressure compensated drippers, the filling and emptying of the irrigation system can lead to severe over and under irrigation in places. This is further accentuated when operating on undulating terrain. Under such circumstances we can improve the hydraulic application uniformity by using low delivery rate drippers. A further outcome when using low delivery rate drippers is “continuous irrigation”. Under the auspices of Gerhard Mostert and Stephan Schoeman, Netafim has done research on citrus to investigate the viability of such an approach. The results indicated that many of the difficulties involved in managing drip irrigation in orchards are addressed by this method. “Continuous irrigation” involves decreasing the application rate of the irrigation system to balance with the maximum daily water use over the total consumptive period of the crop. This is achieved by using only one irrigation shift. The end result is a system flow rate of between 2.5 to 3.5 m³/h/ha according to the climatic crop water demand, with the aim of applying the water within a 14-hour period, using 1.0 and 0.7 litre per hour drippers to prevent irrigation beyond the active root zone. In order to achieve optimal aeration conditions, drippers are spaced so that the outside perimeters of the wetted areas underneath adjacent drippers do not touch. Mostly these areas are 0.8 to 1.2 metres apart. The crop water demand will follow a typical bell curve over the consumptive period of the day while water application will stay constant. This entails an oversupply of water early and late in the day with under application during the peak water consumptive period of the day. The wetted soil volume should compensate for this. The general guideline is to use one dripper per 2 m² of the canopy area of mature trees. Extraction levels were traditionally used to maintain balanced water and aeration conditions within the root zone of the crop. With continuous irrigation, this is achieved through expansion and shrinkage of the wetted area whilst constantly applying water to a portion of the root zone. Irrigation scheduling involves a two-zone strategy whereby daytime irrigation is used to wet the active root zone, while night time irrigation is used to refill the buffer zone when required. As delivery rate decreases, the flow path dimensions of the drippers also decrease. Extra precaution should be taken to ensure longevity of the irrigation system. Always start by analysing the water and the source. Other important hydraulic design parameters are dripper line length, flushing velocity and filtration grade. Special maintenance procedures are put in place to maintain the accuracy of the system. Although the system will operate as one shift, it is still important to accommodate variations in soil type, cultivars, topography and drainage. Various mainline options exist, but in general, valves, automation and fertigation are centralised to the pump house. Energy tariff restrictions: Using one shift, the idea is to have one or a maximum of two start times per day, depending on soil conditions and energy tariff restrictions with the complete area being irrigated at the same time. 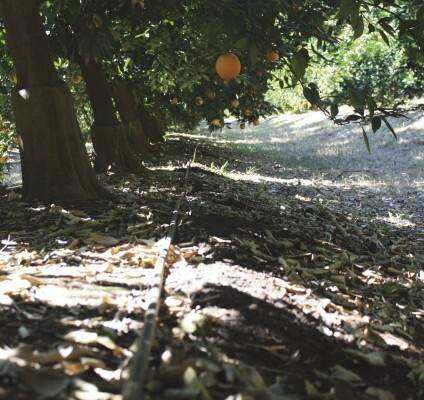 Some of the leading fruit tree producers in South Africa are already reaping the benefits by using this new concept of “continuous drip irrigation”. It opens up a totally new field for researchers to get involved in, and we are confident that it is an introduction to a total new outlook towards the irrigation of fruit trees.